Join the discussion on our forums! Come discuss Archmage Vargoth over in our dedicated Archmage Vargoth discussion topic. I believe the card is meta defining. Amazing card! What's more amazing is that it's a free Legendary. Being played on turn 5 together with a quest, will the quest be casted twice ? Back at Boomsday's launch, I got Flark, and I didn't really pay him much mind, but now... now I see it. Turn 7 Flark, turn 8 Archmage with 2 Feign Deaths and a Galvanized Goblin Bomb. Even if the opponent breaks a few, they're less likely to do so, even if one or two might be magnetized. You can also reinforce the ranks or set them up earlier with Explodinators, Bomb Tossing and Whirligliders, too. AT LAST! FREE FROM THAT BLASTED PRE-RELEASE VOID! BEHOLD DOUBLE RES AND MIND BLASTS! 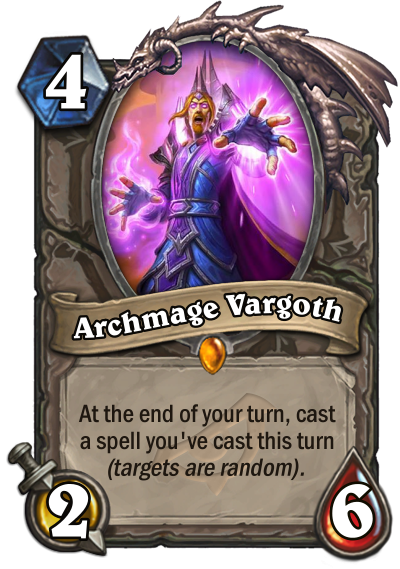 Januari 2019: "We're still talking about a Barnes nerf cuz highroll potential no good"
April 2019: "Free Archmage Vargoth for everyone"
Fits really good into big priest. Enjoy the last days of Frozen Throne. This card is disgusting in multiples and when combined with semi-controllable one way spells, like board clears and buffs. Can't wait to abuse this throughout the year and in wild. Insane potential to go off in the right deck. I currently do run it. Can't say whether it really makes the deck better. But playing this on curve and resurrecting 2 copies, makes my opponents sweat. Let me explain: play it for 4. Opponent is aggro and has no problem killing 6 health. But I save 6 hitpoints to my face. turn 5 i play any resurrect effect. it's doubled and i have 2 archmages. if my opponent takes care of both, he will hurt his board significantly AND i safe 12+ face damage. If he does not, then turn 6 i will summon 2, maybe even 3 5/5 clones from my deck. game over. If my opponent is not aggro, he needs to clear the board for similar reasons. But he is now slow enough that i can just leave vargoth in the res pool. i add something else later, say a LK 5/5 and a 4/8 from hand. spellstone resurrects all 3, vargoth resurrects another 3 copies. would i prefer 2 status, 2 LKs and 2 vargoths over 3 fatties? yes, i do. Also great: 5/5 yshaarj is one of the most devastating outcomes in turn 6. in my experience now, 5/5 vargoth is 2nd best, because he summons another 5/5 copy of something. The downside of vargoth is that you cannot really remove any minion in your deck, so you need to sacrifice safety, but any value oriented game you can gain A LOT. especially the mirror. in the worst case it's a 2/6 with soft taunt. another downside is that it restricts a bit the spells you want to play. coining something out might ruin your plans. shadow word pain kills your vargoth, too. etc. Yeah, I am quite convinced now that you're wrong. This card makes a very notable difference against any type of opposing deck. (unlike Catrina, which is more a win-more card). This card can give you three turns in a row with Time Warp. I tested it!